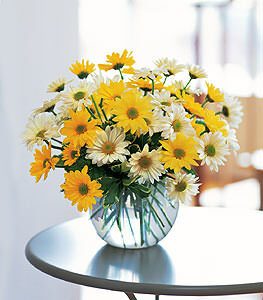 Send these bright and joyful daisies and that special someones heart will skip a beat or two. White and yellow daisies, along with foliage, arrive in a clear glass bubble bowl. Thank you! Everyone loved the arrangement, again thank you! Thank you for doing such a good job - I got such quick, efficient, and friendly service in processing the order; the flower order was able to be delivered the same day which was very important; and, the recipients were very pleased.